Above Colonel Bird’s Bath and in a natural amphitheatre is the impressive collection of southern African cycads, Encephalartos species. Palm-like in appearance, they are often called ‘living fossils’ – not because they are so slow growing or millions of years old, but because fossils show us that they have changed remarkably little since the Jurassic Era, or ‘Age of the Dinosaurs’, 150 – 200 million years ago. 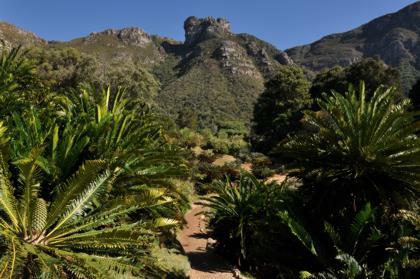 The Cycad Living Collection was the first collection of plants to be established at Kirstenbosch and today contains 37 of the ±40 southern African cycad species. You can see 29 different species growing in the Cycad Amphitheatre, including Encephalartos woodii (Wood’s cycad), Encephalartos latifrons (Albany cycad), and Encephalartos transvenosus (Modjadji cycad). Cycads are mostly rare and endangered in their natural habitats and are constantly under threat from unscrupulous collectors. Kirstenbosch has an active propagation programme to increase the number of plants available to gardeners and collectors and thus take the pressure off the few remaining plants in the wild. Cycad plants are available for sale at the annual Garden Fair and Plant Sale held every March, and at the Kirstenbosch Garden Centre. NB: Cycads are protected by law and a permit is needed to own one or to take one into or out of the country. Visit our plant information website to find out more about southern African cycads.